Your favorite Artslandia Annual is now spread out into 5 bi-monthly magazines. Knowing that many patrons buy tickets as they go, this new format engages and excites with new content every two months. Available to locals and visitors across the city at more than 50 high traffic locations. 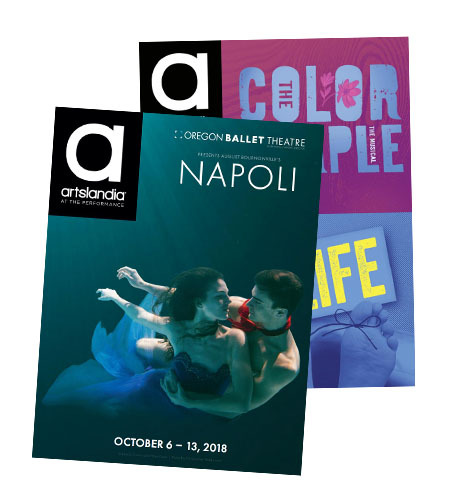 This bimonthly magazine, featuring original content on Portland arts and culture, is custom-bound with our performance partners' playbills. Your ad is automatically included in each issue, which is personally handed to patrons as they enter the venue. 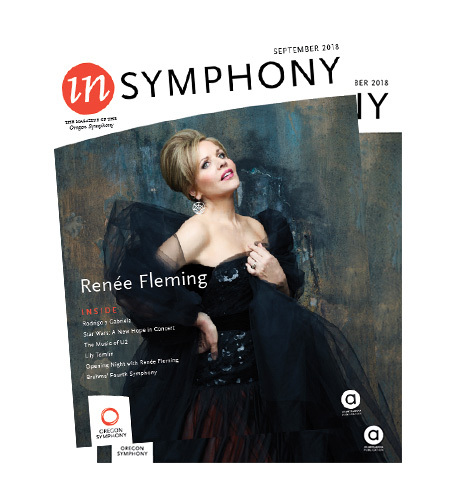 The official monthly magazine for the Oregon Symphony, In Symphony includes programs for the current month's performances and insider coverage of the oldest American symphony west of the Mississippi. Each issue is personally handed to patrons as they enter the Arlene Schnitzer Concert Hall ensuring that advertisers become a part of this uniquely Oregon musical experience. This one-of-a-kind, annual publication includes the playbills for each show of the Opera's current season along with original content that illustrates why the Portland Opera is considered one of the finest and most innovative opera companies in the nation. Each issue is personally handed to patrons as they enter the Keller Auditorium and Newmark Theatre, where it is not only perused upon receipt before the curtain rises but also regarded as a keepsake piece for Opera lovers. This special edition magazine includes original content bound with the playbill for George Balanchine's The Nutcracker, a beloved classic performed by the Oregon Ballet Theatre. With each issue personally handed to nearly 60,000 patrons as they enter the venue, there's no better way to reach Portlanders during the holidays. This bimonthly kids magazine includes original content such as games, puzzles, and stories. Custom-bound with the playbill for each of Oregon Children's Theatre's shows, Oregon Symphony's kids concerts, and Oregon Ballet Theatre's Annual School Performance, this playful publication is a favorite of parents (who use it to distract their children before the curtain rises) and kids (who keep it to refer back to recipes, art projects, and scavenger hunts). Classic Wines Auction has consistently been recognized as one of the Top Ten Charity Wine Auctions in the United States by Wine Spectator Magazine. Align your brand with this elegant evening of wine and food that brings together Portland’s elite to raise money for five local nonprofits. Advertising space is limited. A well-rounded marketing plan reaches people in a variety of ways. Your print buy can be more impactful when combined with our new media products and sponsorships. Think geofencing the Keller Auditorium and retargeting the people who've seen your ad in the The Nutcracker program or sponsoring our Cinema Screen calendar at eight movie theaters across the city.